I have always tried hard to keep track of my friends and family members’ birthdays. Theoretically, this is so I can remember to send birthday cards in a timely manner; this doesn’t always pan out. I bought a perpetual calendar from A Little Hut when I moved into my first apartment and it has been hanging on the wall ever since. 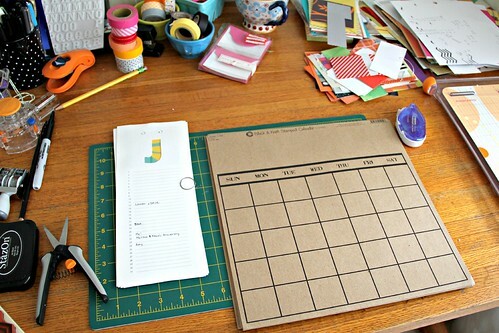 I have wanted to find a new one, one that looks more like a grid-style calendar, but my Etsy searches have turned up nothing of much use. So I decided to make one myself, and it felt more important to do this now that we have friends and siblings who have anniversaries we need to keep track of, not to mention the birthdays of little ones and in laws. I found kraft calendar paper on the Paper Source website that was perfect. (It’s not on the PS site anymore, but I saw it at a local store as recently as last weekend. 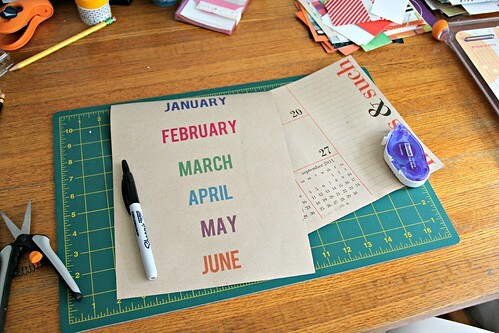 It’s “black and kraft stamped calendar paper” from Canvas Corp – also online here.) I’ve had it for months, but only got the motivation (or free time) to put the new calendar together this past weekend. First, I chopped up the old pages from my Paper Source Big Wall Calendar into a size I could feed through my printer. I made a canvas in Photoshop Elements with the month names and then printed on the back of the old calendar pages. I glued the month names to each page, and decorated with washi, each month slightly differently. 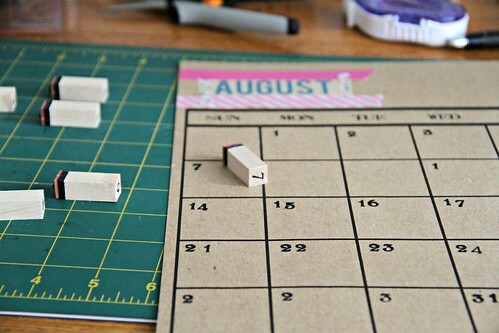 I then used number stamps to stamp the days onto each month. Again: tedious but so worth it for the cute factor. 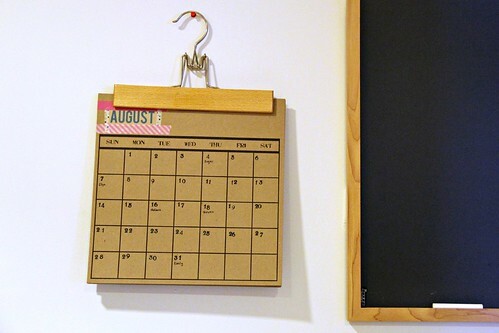 I used a vintage hanger to hang it in our kitchen next to our blackboard, and now we have an easy reference for birthdays and anniversaries. Simple but perfect. I think I’m going to steal this idea. Wonderful!